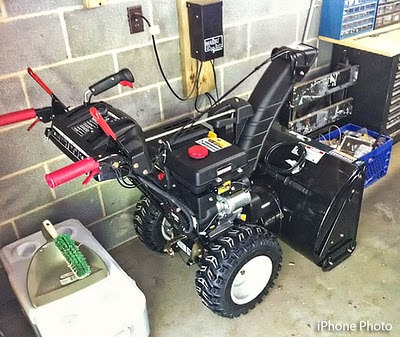 After last years massive amounts of snow I vowed to get myself a snowblower for the garage. But it couldn't be just any snowblower. After doing my research I found that the Craftsman model 88830 looked like it would do the job. This unit is capable of clearing a 30" path and has an intake height of 21". The 357cc 4-cycle OHV engine is pretty strong for the deep stuff. 16 x 6.5 X-TRAC tires look like they will give plenty of traction on the hills. With power steering, heated grips, and even a headlight, I may be out all night after the first snow! Sears had the unit on sale for $250 off their regular price so this beast now sits quietly in my garage waiting for the first storm. It's a little weird buying a snowblower when the temps outside are still in the 90s.